Sean Dyche felt Manchester United were just too strong for his side, as they suffered a third-successive Premier League defeat. Two first half Romelu Lukaku goals handed United the points, with Paul Pogba having a penalty saved by Joe Hart after the break, before Marcus Rashford was sent off after thrusting his head into former Red Phil Bardsley’s. But Burnley struggled to craft chances of their own, and were ultimately well beaten. Asked if United were too good, or Burnley not quite at it, Dyche accepted: “A bit of both first half, they started very well, I did remind all of you before the game, they’re a good side. “They’ve had a few question marks, but when good players are tested, from the outside looking in, usually they react, and they did. “They were very good in the early stages of the game, had us on the back foot very early, and it’s one of those...it’s very good thinking to yourself ‘go and do this and do that’, but it’s difficult when you’re out there. “They’re a good side, they use the ball well, their movement was good, they look strong defensively. “We had passages, we had pockets, but the second goal was the real one that hurt us. “Yes, we could have done better with it, but equally, it hits Chas (Taylor) and lands right in his path. “Usually you need those things to go do you, particularly against these big sides. “Overall, a mixture in the first half, second half I thought we had a go, and we gave a better account of ourselves and had moments - although they had breakaway moments. Dyche made changes to his Premier League starting XI for the first time this season, giving starts to Bardsley and Taylor, with Dwight McNeil also making his first Premier League start, against the club that released him four years ago, aged 14. 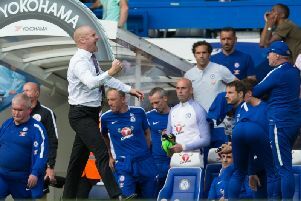 Dyche explained: “We’ve been trying to monitor the workload of the players, equally monitoring the ones who have laid down a little bit of a marker and done well.